Cloncagh church ruins are situated in the centre of Cloncagh graveyard. In 1840, J. O'Donovan stated that "the nave is thirty seven feet in length and sixteen feet in breadth but the dimensions of the choir cannot be determined." John Begley describes the old church at Cloncagh to be in a state of dilapidation. Only the north wall and the west gable of the church now remain. Begley believed that the church was connected to St Maedoc's monastery. The church is located in a seven-acre bivallate ring fort. During the Earl of Desmond's revolt, in 1579, the Irish returning from the Battle of Monasteranenagh sheltered in the church. a Holy Well near the church is dedicated to St Patrick. There is a record of the burning of Clouncagh church in 1326 by the Irish in their war with the Normans. It is possible that the present ruin was built on the site of this original church, although we could find nothing to substantiate this theory. The original church structure may have been part of the monastic site reputed to be established by St Maedoc in the seventh century. 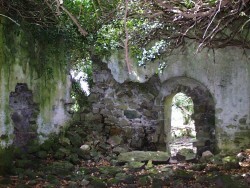 There is a church ruin in the townland of Ballynoe called Clonelty. According to Lewis, the church of Clonelty is supposed to have been founded by St Ita in the seventh century. However, St Ita is known to have died in the sixth century. O'Donovan suggests that St Mida, or Ida was the patron saint of the church of Clonelty. It is possible that there may have been a timber structure in place before the stone church was built. This ruin, which is thought to date from pre-Norman times, measures about 50 feet in length and 21 feet in width. 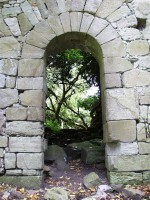 The doorway of the church is in the form of an archway. This church was used as a place of Protestant worship in the 18th century. 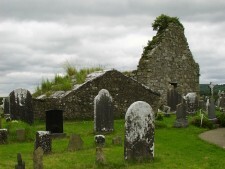 There are church ruins and a cemetery in the townland of Grange. It is unknown whom the church was dedicated to. The graveyard is still in use. In 1840 John O'Donovan described the church as being "sixty two and a half feet long by twenty-one and a half feet". O'Donovan also tells us that the walls were in a perfect state in 1840 and that, at the time, the church was only recently out of use. Westropp mentions church ruins in Ballyhahill and Kiltanna, but no trace of these structures remains. 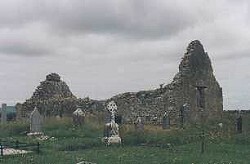 There appeared to be traces of a church ruin in Kilcolman cemetery. However, we did not find any references to such a church in our research.